When DC announced Wonder Comics it was as a new line aimed for younger readers. 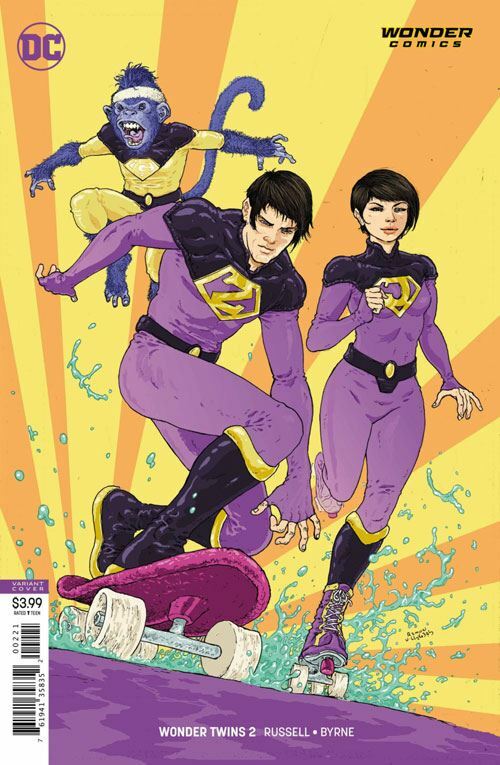 I had not expected to enjoy these very much, but DC is not dumbing these books down, if the latest issue of Wonder Twins is anything to go by. Yes, there is a lot of humour in this one. Beast Boy guest stars, and plays the clown he does so well. Zan seemingly cannot help being goofy, and the villains are a silly lot, for the most part. But the core of this story deals with private prisons in the US, and the way inmates are used as cheap (effectively slave) labour. That was not a topic I would expect to see dealt with in a comic book aimed for younger readers. Not that I am criticizing it. Far from it, this highlights some serious issues, but does so in a way that is breezy and entertaining to read, without weakening the message. In fact, there is some real tragedy buried amid the silliness. One of those that the Wonder Twins wind up facing is a vampire who has sworn off drinking blood. This gets discussed in terms of an addiction, and even though the character is among the bad guys, his determination to overcome blood drinking makes him sympathetic. So it’s just horrible when the private prison system lets the guy down, shoving him into a drunk tank where the temptation is far too great, and he gives in. This is not a victory for the good guys, not at all. I am very impressed by this issue. It’s really the last thing I expected from a book devoted to the Wonder Twins.